"Great job, M, Now spell 'stroopwafel.'" "It's okay, baby. I don't know how to spell it either." So it goes these days with my oldest daughter M. She's just a few months into first grade but knows how to spell most anything we can throw her way...and the thing is, she actually enjoys it. Weird kid. 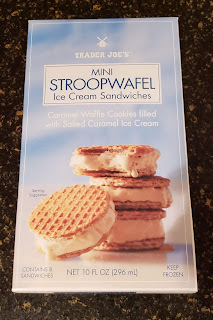 But she insists on spelling things at random, including when requesting her dessert the other night, which, of course, was one of Trader Joe's Mini Stroopwafel Ice Cream Sandwiches. There's been a buzz about these recently. And with good reason. I mean....stroopwafels. Who can hate on them one bit? And ice cream too! These seem to be a match made in heaven. I'll have to admit that I'm underwhelmed here, unfortunately. I kinda hate when something seems to be so built up, so buzzworthy, and purported to be something so amazing and divine, just for my experience to be so lacking. Is it me that's wrong, or is it all of you? Hate those questions. Where to start? The taste. Yes, as one would expect, there's a fair amount of caramel here. But it's flat, very flat. 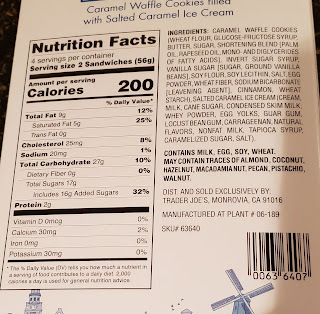 The layer in the stroopwafel is frozen and hard and kinda bland, and it's not a strong flavor out of the ice cream either. There's none of the purported saltiness. 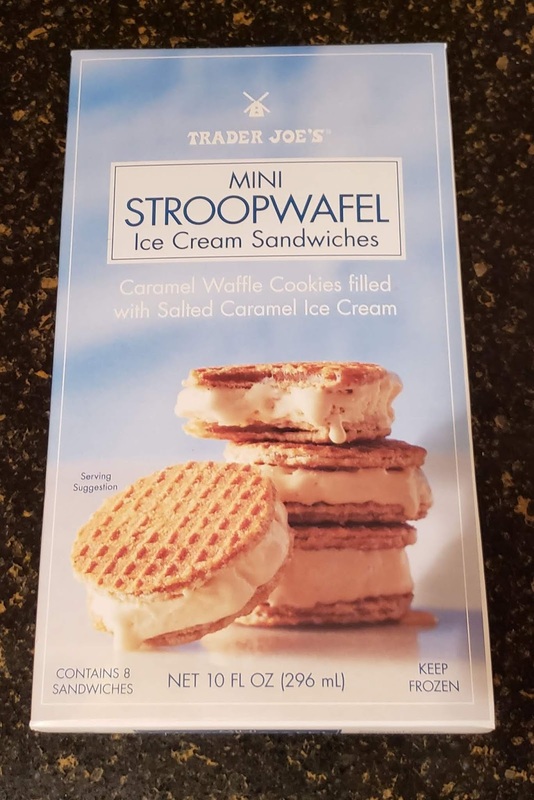 Also, frozen stroopwafels aren't particularly fun to bite through. 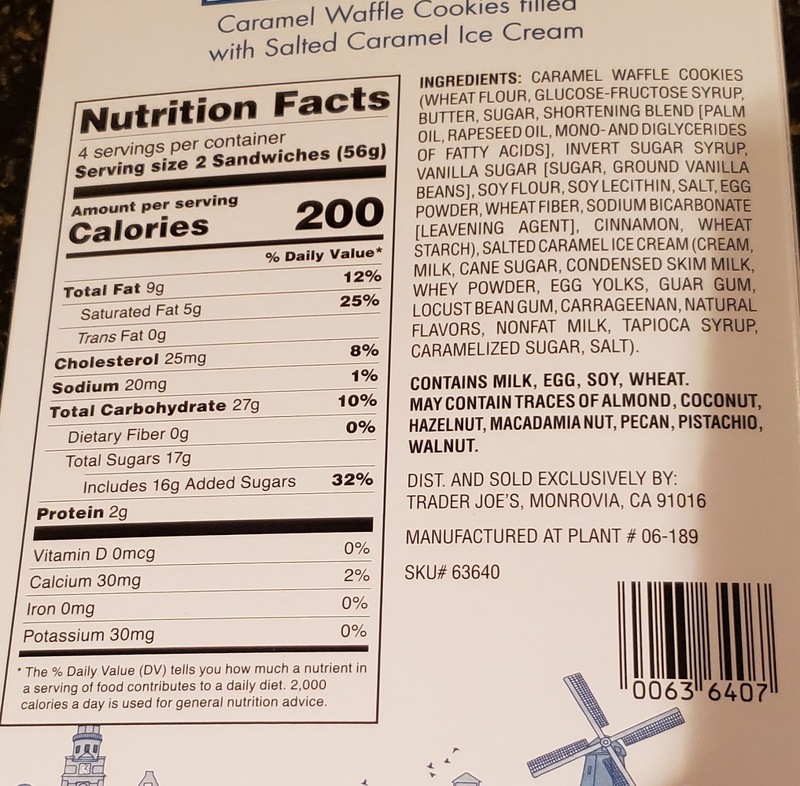 Which I guess shouldn't be surprising - they are a wafer meant to be placed atop a hot cup of coffee, and we're at the other end of the spectrum here - but it's a little stiff cardboardiness going on. Ice cream layer is just fine. I'm not impressed to be honest. These mini ice cream sandwiches could have been better with some stronger flavor and softer caramel. A serving size is two of these buggers but I was happy enough with just one - a second didn't seem worthy of my caloric indulgences for the day. I cannot be any less excited about them, which pales in comparision to how I felt pre-purchase. it's just meh all the way around, no matter how you spell it. Meh meh meh. I bought two boxes and was so excited but you're right...these were so disappointing. The cookies were hard and the ice cream wasn't great either.